Amit Bhatnagar asks: Where did the American tradition of trick or treating come from? The practice of wearing costumes or masks during this sort of end of Autumn celebration comes from a Celtic end of year (they celebrated their New Year on November 1) Samuin tradition. During Samuin, young men impersonating evil spirits by dressing up in white costumes with blackened faces or masks. It was believed that during the transition from one year to the next, the realms of the living and the dead would overlap allowing the dead to roam the Earth again. Thus, by dressing up as spirits, they were trying to fool actual spirits into thinking they were as well, which is particularly helpful when encountering evil spirits. Beginning in the 8th century, the Catholic Church was trying to provide an activity that would hopefully stamp out the old Samuin traditions. They came up with “All Hallows Even (evening)”, “All Soul’s Day”, and “All Saints’ Day”. Many of the traditions of Samuin were then adapted into these festivities and by the 11th century, the Church had adapted the Celtic costume tradition to dressing up as saints, angels, or demons during this celebration. As for the trick or treating, or “guising” (from “disguising”), traditions, beginning in the Middle-Ages, children and sometimes poor adults would dress up in the aforementioned costumes and go around door to door during Hallowmas begging for food or money in exchange for songs and prayers, often said on behalf of the dead. This was called “souling” and the children were called “soulers”. As you might have guessed from the song, a common food given while souling was a Soul Cake (also sometimes known as a Harcake). Soul cakes were small round cakes, often with a cross marked on top, that represented a soul being freed from Purgatory when the cake was eaten. Soul cakes were generally sweet cakes, including such ingredients as nutmeg, ginger, cinnamon, and raisins. Souling ultimately gave rise to guising in the U.K. starting in the 19th century, with children dressing up and begging for things like fruit and money. In order to earn this token, they’d often tell jokes, sing songs, play an instrument, recite a poem, or perform in some other way for the amusement, not unlike the old tradition of souling but instead of prayers, a performance was offered. The practice of guising made its way to North America, probably brought over by the Scottish and Irish in the late 19th or early 20th century (first documented reference in 1911). Trick or treating instead of guising on Halloween popped up in North America in the 1920s and 1930s, first in the western half of the continent. The term and the practice slowly spread, with a brief respite during WWII. After the WWII sugar rations were lifted, Halloween’s popularity saw a huge spike and within five years trick or treating was a near ubiquitous practice throughout North America. During Samuin, it was also traditional to leave a place and food at the table for deceased loved ones temporarily returned from the grave. The word Halloween originally came from the Middle English ‘Alholowmesse’, meaning “All Saints’ Day”. The night before Alholowmesse was called “All Hallows Even (evening)” which was eventually shortened to “Hallowe’en” until it just became “Halloween” in the 20th century. In North America alone around $3 billion is spent on Halloween costumes. Haunted house attractions bring in about half a billion dollars annually. 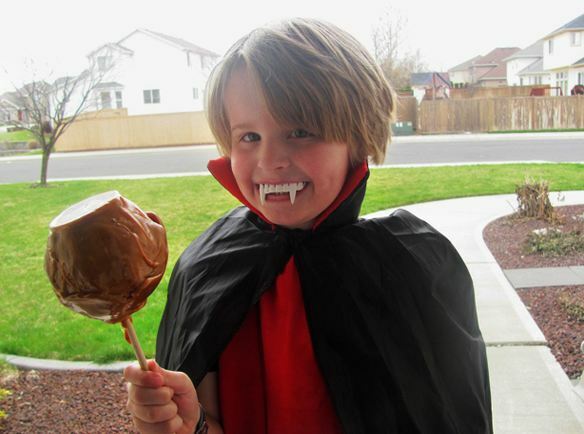 Halloween candy sales average around $2 billion per year in the United States. Chocolate candy bars are consistently ratedas the #1 treat to get, with the Snickers candy bar being most preferred. In addition, Reese’s peanut butter cups and candy corn are among the most sold Halloween candy items. Over 35 million Halloween cards are given every year, producing close to a gross of $100 million. As you might have guessed from these numbers, Halloween is the second most commercially successful holiday world-wide after Christmas. Around 35 million children in the U.S. between 5 and 13 years old go trick or treating every year, which is around 90% of all children in that age group. Around 50% of adults in the U.S. will dress up for Halloween and about 67% will attend a Halloween party or go trick or treating with their children. If you’ve read Shakespeare’s Two Gentlemen of Verona, you might have recalled him mentioning the Hallowmas practice of begging door to door. VALENTINE: Why, how know you that I am in love? Starting in the 1950s, UNICEF began distributing small boxes and bags to kids to take around with them while they trick or treat. The kids would then try to solicit donations for UNICEF from people they were also getting treats from. UNICEF has used this program to collect about $167 million and counting. The other major generally put forth reason for this style of trick or treating is that it’s quicker and easier on the parents than walking or driving their kids around… Trunk or Treating parents who are doing it for this particular “benefit”, remember when you were a kid running around neighborhoods with your friends trick or treating? Remember how awesomely fun that was, not just from getting candy, but from the whole experience that only comes once a year and only for a small number of years before you’re too old? This doesn’t need to be shortened to a quick parking lot experience where you step five feet in between candy deposits, with the trick or treating done in less time than it takes to watch an episode of SpongeBob.